Belief is one of the most important components of human life. Whether you believe in the teachings of the Bible, the Torah, the Qu'ran, or nothing at all; whether your beliefs are on strictly religious or political lines (or, more often, a mixture of the two), what you believe in is crucial in defining who you are as a person. For most people, it isn't necessarily the single thing that you allow to define you, but is certainly something that colours your decisions, the way you act and the way that you interact with the world around you. Xavier Beauvois' film, Of Gods and Men, is about men who have dedicated their lives to their beliefs, and the ways in which that dedication manifests itself in their actions. 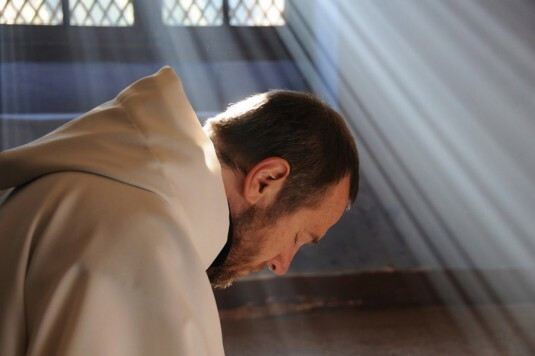 Set in Algeria in 1996 and based on a true story, Of Gods and Men focuses on a group of Trappist monks who live in a community comprised of both Christians and Muslims, and into which they seem to be well integrated. They act as spiritual advisers to their flock, but also have a strong relationship with prominent members of the Muslim community, as represented by their invitation to a private birthing ritual in an early scene in the film. When a group of Islamic extremists show up at their door late at night, demanding that the monks provide them with medicine to help an injured comrade, the broader political and religious turmoil in the country becomes terrifyingly specific for the monks. They are confronted with a decision which is as simple to describe as it is impossible to decide; should they stay, despite the risk they face, or should they leave? Much of the conflict, suspense and drama in the film unfolds from the ways in which each of the monks comes to terms with their situation. Beauvois' film starts off slowly, taking its time to introduce the monks and acclimatise us to their way of life. We watch Christian (Lambert Wilson) as he takes walks through the monastery and the village. We watch Luc (Michael Lonsdale), in his role as one of, if not the, only doctors in the local area, treating locals for their various maladies. We watch as the brothers gather together to perform hymns, eat together and discuss the business of their day. The film proceeds at a very deliberate pace that, at least initially, seems at odds with the direction that anyone familiar with the real events knows the film must go. However, much like Gus van Sant's Elephant, the film does not set out to shock from the outset but to create a tapestry. Thread by thread, it constructs the rhythms and rituals that comprise the lives of these men. Once we are used to their routine, the arrival of the extremists into the region is all the more jarring because we know the peace that has been shattered, and that it can never be regained. Beauvois underlines this clear, irrevocable change by having the extremists first appearance be when they murder a group of foreign contractors working nearby, a scene delivered with a clear-eyed precision that, rather than detracting from the sudden outbreak of violence, makes it all the more shocking. One of the great triumphs of the film is the nuance that Beauvois and his cast bring to its depiction of the faith of both the Christian and Muslim characters. In Christian's discussions with people in the Muslim community, the film makes a point which far too films, or works of art of any kind, care to make; not all Muslims are extremists. Many of the Muslim characters in the film express their dismay at the violence being carried out, for example, against a woman who was "only" wearing a veil, and the film subtly and succinctly expresses this sense of a community divided against itself. Even the extremists themselves are shown to be complex, contradictory people, capable of showing kindness and respect towards the monks, even as they are threatening their lives. The film asks some tough, pointed questions about the ways in which we allow belief can alter the ways in which we perceive people, and also has the good sense not to offer any simple, comforting answers. The film also refuses to assign a definitive interpretation of the actions taken by the monks, instead leaving that up the audience. It's a masterstroke that prevents the film from being merely a film about Christians, but about faith and belief in general. As an atheist, I thought they were incredibly brave men who did what they thought was right in a situation which might not have had a right answer. If they stayed, they risked being murdered. If they left, they would betray their community. Neither was a wholly good option, and I was never in doubt that whatever they chose to do would lie heavily on their consciences. It's difficult to single out one actor or scene for praise, partly because the film is so uniformly excellent, but also because it is so focused on mood, tone and emotion that the actual events in the film don't take precedence. The one exception, and it is probably the most discussed aspect of the film, is a scene towards the end of the film in which the monks all sit down to supper. The scene is little more than men sitting around a table, eating, drinking and listening to Vivaldi. That's what the scene is taken at face value, but ignores the value of its faces. As the camera pans from face to face, music obscuring all noise and talk, we see the conflicts and concerns of the film playing out in the smiles and tears of these characters that we've grown to know and cherish. It's an incredibly simple scene that conveys boundless complexity and fathomless depths, and demonstrates the power of the close-up that is so unique to film. Much like its characters, Of Gods and Men is a brave, intelligent piece of film-making that follows its convictions to their inevitable end. It's devastating and astonishing on an intellectual, emotional and spiritual level, and easily one of my favourite films of the year.